I’ve never been a fan of the mid-’90s – early 2000s Suzuki Katana. To me they were fat, underpowered, and hideously ugly – three traits that should spell instant death to any motorcycle. It’s an utter shame the Katana name – a once well respected and sought after model – was attached to that motorcycle in the end. I made my distaste of that bike well known when I met James for the first time. He laughed it off, even agreed with me on some points, then changed the subject. It was like he knew the Katana he was riding was bad, but didn’t want to dwell on it any more than he had to. Maybe he got it for free? 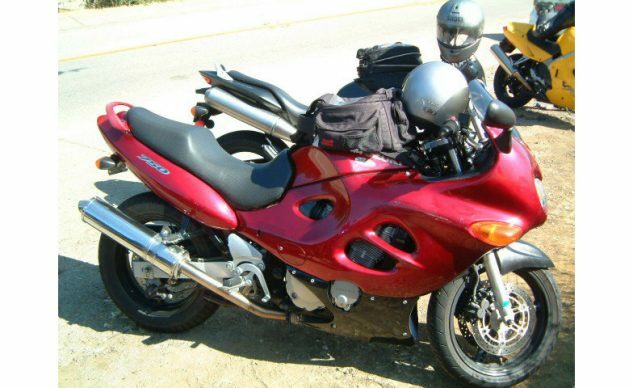 I was still new to motorcycles at that point, and was lucky enough to stumble upon a forum group that held regular rides where newbs were welcome. James took me under his wing. I didn’t ask for it, nor did I really even seek it, but we somehow formed a bond. You would think trashing someone’s motorcycle would put you on an instant ban list, but for whatever reason after that, we hit it off. I like most motorcycles. I don’t like the late-model Suzuki Katanas. Thankfully, people like James exist to keep them on the road. 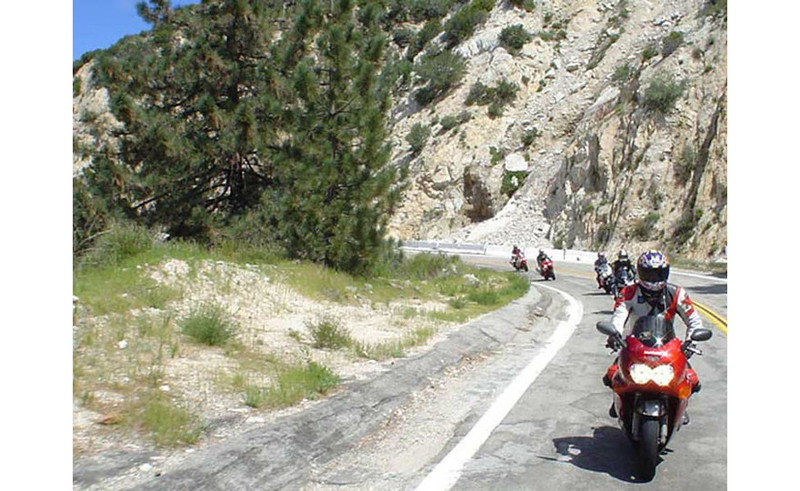 It started out as they usually do, with group canyon rides with our fellow forum buddies. When we weren’t riding, we were talking about riding on the forum. We all became surprisingly tight. As the collective group, including James, started to pick up the pace, we eventually turned to trackdays together. 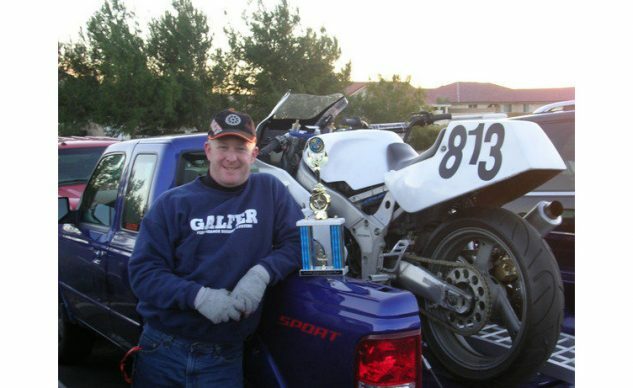 James was never the one to give me pointers on how to cut seconds off my lap time – there were other people in our group better suited for that – but he did freely give me advice on how to stay safe on the road. 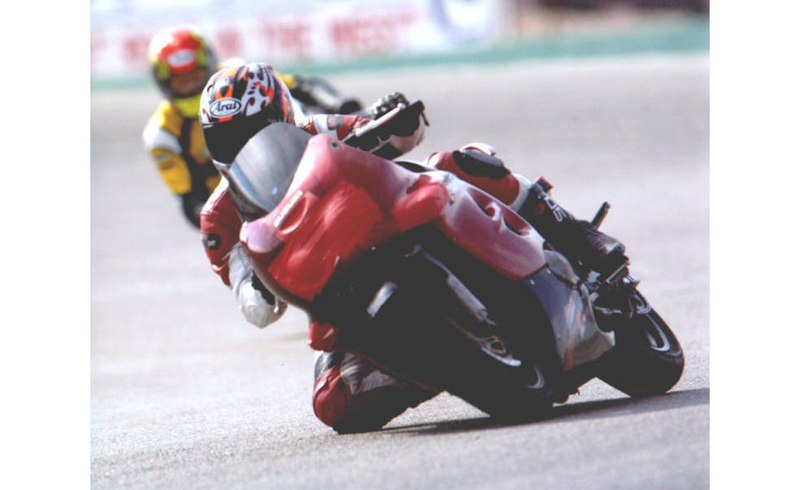 During and after each trackday, when our group would all laugh and joke about battling each other, James and I would go back and forth about the dicey passes we made, he on his Katana and me on my SV650. Despite the fact he was hustling that poor Katana as far as she would go, I’d still tease him and say how much better off he’d be if he just got a real track bike. Before long, a grey-market Yamaha FZR400 showed up in his garage. He never told me he was looking to buy one, so this came as a shock. Maybe that was his goal the entire time. I think he even won a couple novice races on it, too. But still, that damn Katana remained parked in the back of his garage. James, doing his part in leading a group canyon ride with some newer riders. Eventually I couldn’t take it anymore and I had to ask him why he liked that Katana so much. “I don’t,” he replied. You see, he didn’t choose the Katana. The Katana chose him. I learned that James had a younger brother, roughly my age, who loved to ride. Except his riding career was cut short by a terrible traffic accident that took his life. This was his Katana. As part of his grieving process, James inherited the Katana, fixed everything that was broken, and put it back on the road. Riding it daily would be his way of remembering his brother. Taking me under his wing was his attempt at making sure what happened to his brother didn’t happen again. Of course, now knowing the history of the Katana made me feel absolutely terrible about myself, but James assured me it was fine. Thick-skinned and witty, able to take it and dish it back out, that’s James. When he wasn’t riding, he was usually somewhere cool, clearly not chained to a 9-to-5 like the rest of us. Our bond grew greater when I discovered he was a writer by trade (thus explaining his witty comebacks). His main gig was writing ad copy, marketing materials, and building websites for commercial clients. All of which he could do virtually anywhere with an internet connection. So, I’d pick his brain about the writing process, how to work from anywhere, and just life in general. He always had a thoughtful answer, with witty humor strewn throughout. “Damn, he’s good.” I would inevitably blurt to myself – each and every time. To this day I try to incorporate his advice and his style when I write. Unfortunately, I know I’m never going to measure up. The Katana had already been crashed once, so he didn’t care if it tumbled down the road again. As tends to happen in life, we grew apart. More so on my end. 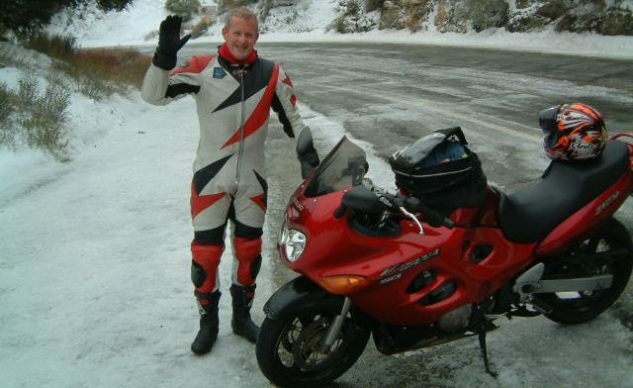 My cushy magazine job writing about motorcycles kept me busy, but whenever I would post something, James was sure to leave me a witty comment. A not-so-subtle reminder that he was watching. Still, he made time to come to my wedding, where we chatted as if we last saw each other yesterday. 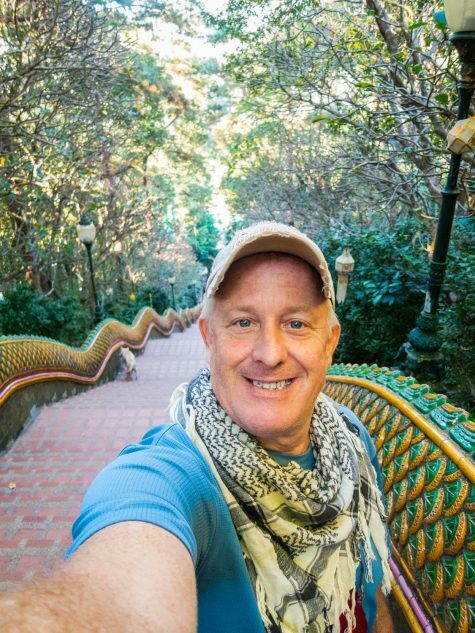 Soon after, he made a big move – packing all his earthly belongings into a carry-on backpack and booking a one-way ticket to Thailand. Of course, he bought a scooter to get around. Our communication really became sparse after that, but social media kept us both in touch – me envious of his travels and life experiences, he jealous of the latest bike I was riding (or so I assume). A note on holidays or birthdays reminded the other that they still cared at least enough to post 140 characters or less on their respective walls. Often it was just two words. Somehow it was enough. We knew the other one was watching. James is proof that if you can ride a Katana quickly, once you hop on a “real” sportbike the results come naturally. James died yesterday. It hasn’t even been 24 hours from the time I write this that I got the news. Unexpected doesn’t begin to describe the whirlwind going through my head. He was as full of life as anyone I’d ever known, with a memory bank of life experiences many, including myself, will only ever dream of. I don’t know how it happened at this point, but it really doesn’t matter anymore. He’s not the first of my friends to pass, and he surely won’t be the last, but it’s always the unexpected ones that sting the most. James was a big presence during my early riding days, and though we grew apart geographically, I’d like to think we stayed close electronically. I had another topic I was originally going to write about today. One I had put a tiny bit of thought into. But today is not the day. Instead, you’re getting my stream of thought as I mourn the loss of my friend. Rest in peace, James. I hope I made you proud. Now you and your brother can go annoy everybody upstairs on your ugly Katana!